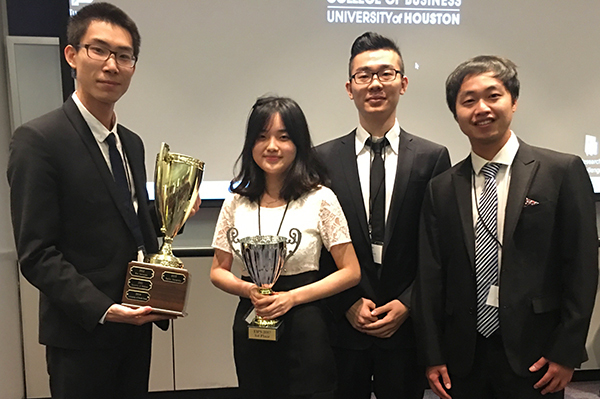 Freeman Master of Finance students Ji Qi, Zhifen Hao, Tong Li and Kaixing Liu, left to right, won first place in this year’s TIPS Portfolio Managers Competition. 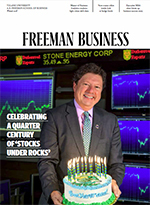 A team of Freeman School Master of Finance students won first place at the TIPS 2017 Student Portfolio Managers Competition. The competition, which took place on Feb. 25 at the University of Houston, is part of the Texas Investment Portfolio Symposium (TIPS), an annual forum for students and faculty from universities in the region with investment management curricula. Structured like a “finals presentation” that investment firms make in order to compete for an institutional account, the competition gave participating teams 10 minutes to describe to judges their investment philosophy, decision-making process and investment style as well as review their long-term investment results. Freeman MFIN students Zhifen Hao, Tong Lin, Kaixing Liu and Ji Qi earned the top prize with a presentation on the Darwin Fenner Student Managed Fund, which is part of an invitation-only honors seminar that gives students hands-on experience managing investment portfolios. Students in the course seek long-term positive results and low risk by employing a methodology that includes incorporating scholarly research into their decision-making process and screening stocks based on extensive fundamental analysis. For the competition, Hao, Lin, Liu and Qi discussed the fund’s $1.7 million mid-cap portfolio, which has generated a compound annual rate of return that is 5.1 percent higher than the S&P 400 over the last three years. Other finalists in this year’s competition included Baylor University, which finished second, Texas State University, which finished third, Rice University and the University of North Texas.